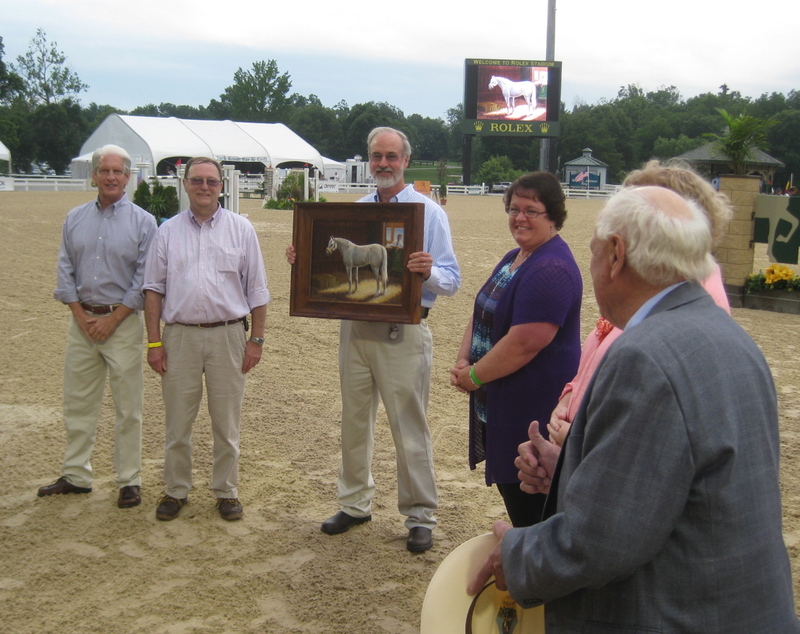 He captured the moment just as the painting of "Snowman and Harry" was being presented to Bill Cooke, the director of the International Museum of the Horse. On the right is Harry de Leyer giving the thumbs up sign! Elizabeth Letts, the author of the book "The 80 dollar champion" is hidden in this shot but she is standing next to Harry in the pink shirt. I am next in the purple sweater. Dr. Tom Riddle from Rood and Riddle Equine Hospital in Lexington is holding the painting. 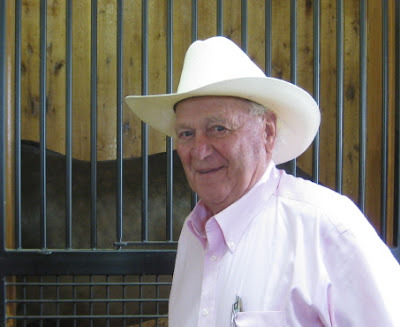 Bill Cooke, the director of The International Museum of the Horse is next to Tom and to the far left is John Nicholson, the executive director of The Kentucky Horse Park. 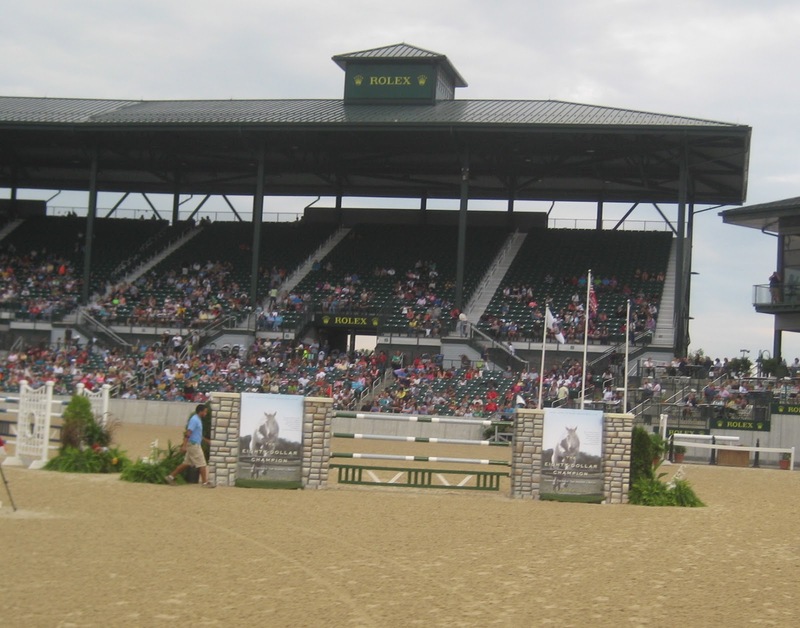 Standing center ring at the Rolex stadium with the painting image on the jumbo tron......looking at the one and only Harry de Leyer's reassuring smile and wink..... I couldn't have even dreamed that up......It is a moment that I will not forget. I love this shot of Harry de Leyer during our tour of Spy Coast Farm in Lexington, KY. He has a such a kind face.......because he is a kind person. A surprise for all of us was to see the "80 dollar Champion" book cover jump standards at the Rood and Riddle $50,000 Grand Prix competition at Rolex Stadium that evening. 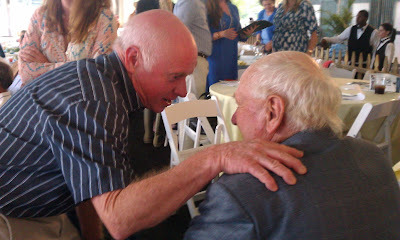 After dinner in the sponsors tent I was happy to snap this shot of two "Hall of Famers" having a chance to finally meet. Chris McCarron and Harry de Leyer. Good thing Len remembered to snap this picture of me and the head portrait of Snowman that I completed for the live auction event sponsored by Rood and Riddle Equine Hospital for the benefit of The Kentucky Horse Park Foundation and The Kentucky Equine Humane Center. It wasn't even dry when it was wisked off to the auction block. It now has a new home at a beautiful farm in Paris, Kentucky. I’m an artist working near Nashville, Tn. Painting Equine subjects in oil is my specialty. Childhood years were filled with caring for,riding and showing horses. Next came graduating from the University of Delaware with a degree in Art Education. I continued study in Illustration at the Philadelphia College of Art. My first job out of college was teaching art at The Sanford School in Delaware. After a few years I married and moved to North Carolina. Next was a position as an illustrator for the North Carolina Underwater Archaeology Lab working on the USS Monitor project. In those early years we had two sons who gave us more joy than I can describe. They still do. We raised our family in Tennessee and still love it here. 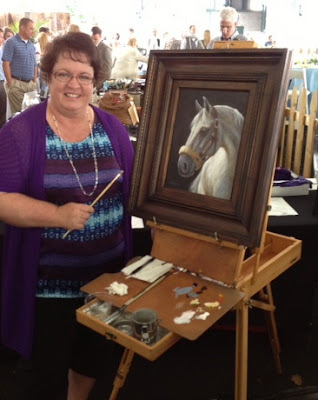 Returning to my love of horses and art, I officially started my Lakehill Studio business in 2006. My paintings have since been published in numerous equine themed publications on the covers and in featured articles. So, here I am, living a dream of combining art and horses and meeting wonderful people along the way.